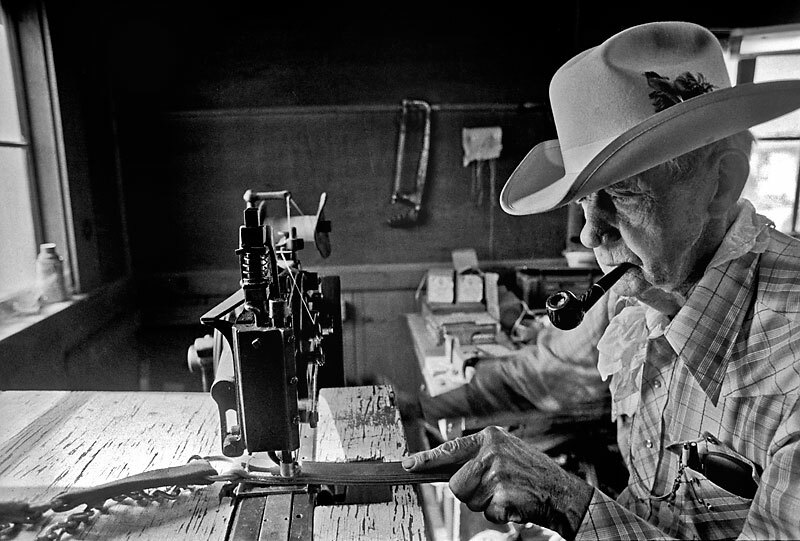 In the middle of June 1975, Laurelei Mullens, Modesto Bee features editor, sent me to south Modesto to photograph Jess Tharp, an 80-year-old cowboy saddle maker. Mullens was doing an advance story for the big Modesto Independence Day Parade. 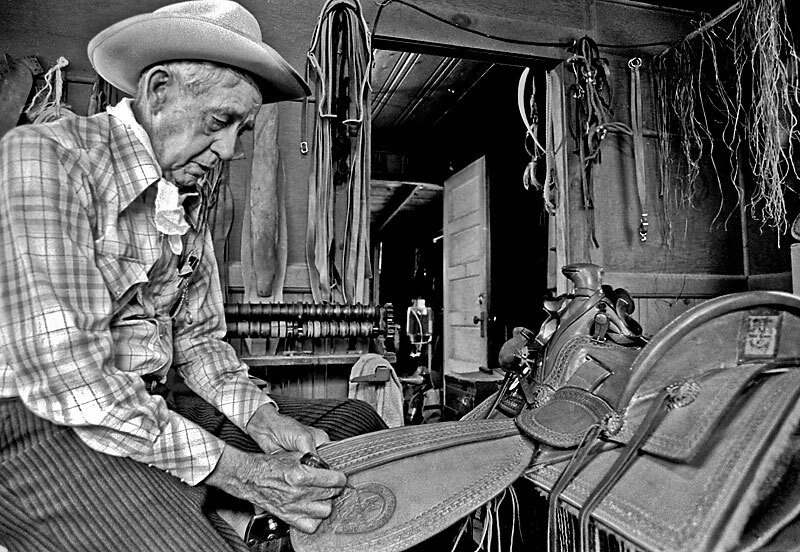 She wanted to do the story about Tharp because he would be the oldest rider in the parade and had been making and repairing saddles for over half a century. When Tharp returned home in 1919 after serving our country in World War I, he changed careers. Before the war, he had been a full time cowboy. 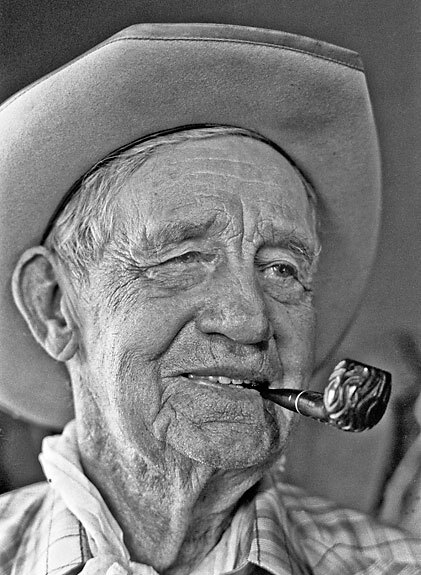 After the war he was offered $35 and beans for breaking horses, a job that had paid twice as much before the war. 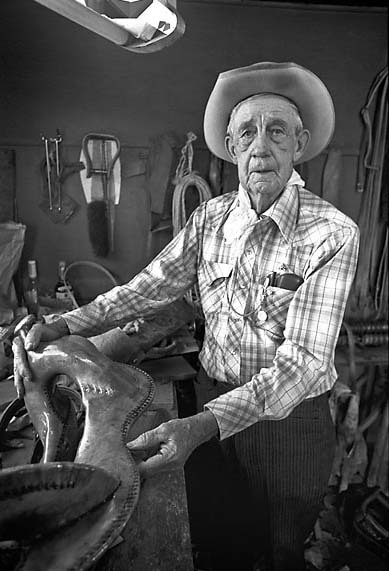 He said, “Forgit it.” From 1922 on, he would be a saddle maker. 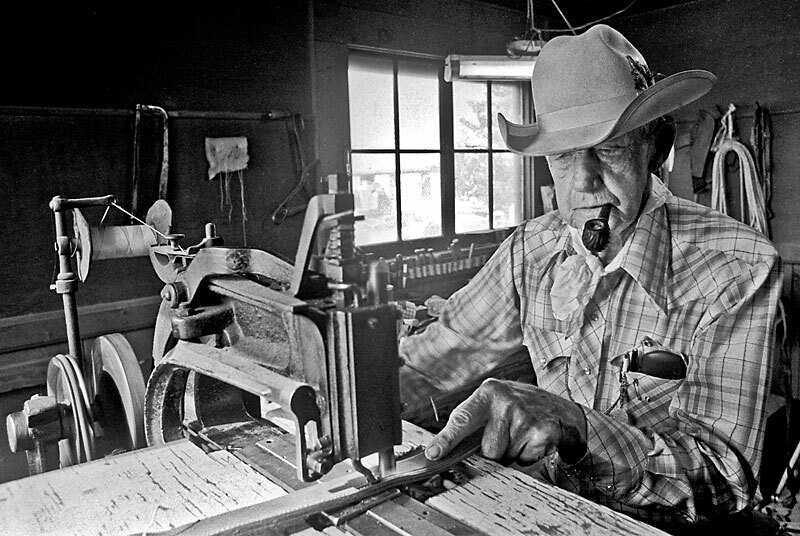 He got his start in a saddletree shop in Utah. Jess’s saddle shop in Modesto was full of smells that were familiar to me. I grew up in my father’s shoe repair business. Golub’s Shoe Repair smelled of freshly tanned leather just like this saddle shop. There was a heavy coat of dust that came from shaving leather and the tools were similar to those I played with as a kid. To see Jess’s images on Photoshelter click here. Jess took cheerful pride in the saddle he was going to use in the 4th of July parade. He used a saddletree that was older than he was, made in 1882. 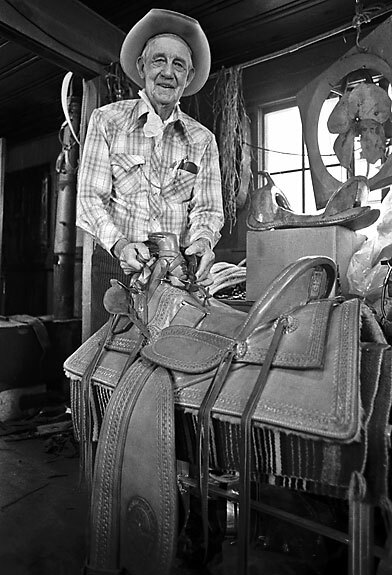 He restored the saddle the year before, but this would be the first time he used it since the restoration. Jess gave me a quick lesson in hand tooling. He let me practice making an acorn pattern on a scrap of leather. 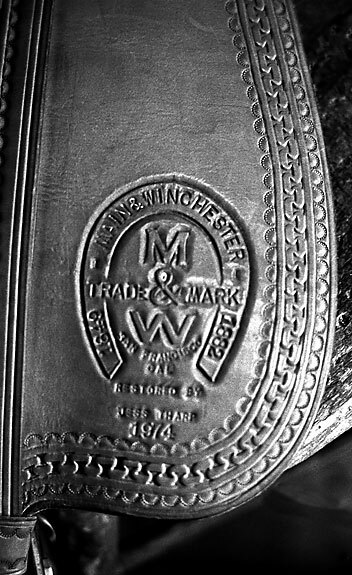 He hand tooled the Main & Winchester trademark on the fender of the saddle. 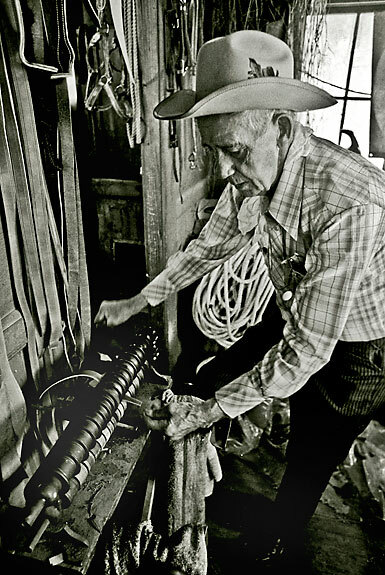 The Main & Winchester Saddlery was one of the best known among the Old West Saddleries. They were a San Francisco based business that started up during the Gold Rush of 1849. Jess works a hand-operated cutting machine for making leather strips to be used as reins and other rigging. 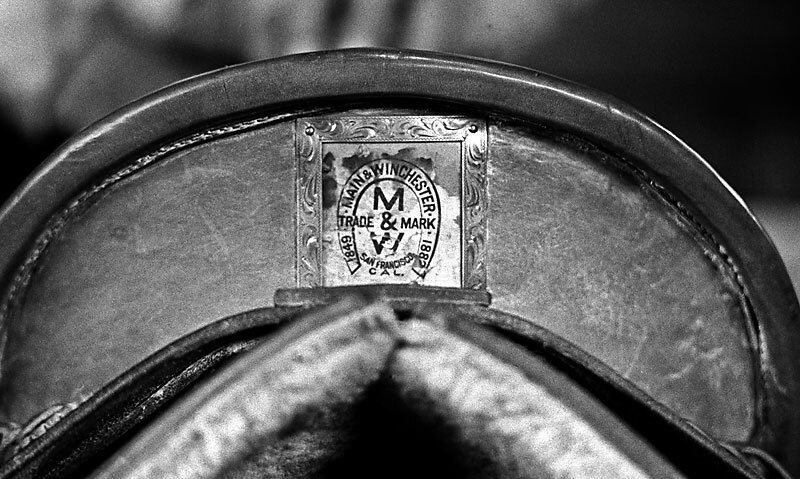 On the cantle of the saddle was the original trademark. Jess’s pride and craftsmanship reminded me of my father and the shoemakers that worked with him. 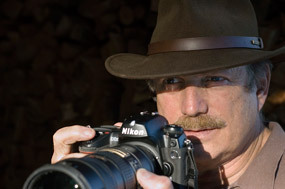 I know my craftsmanship and sense of pride for my photography comes from what I learned from my father. July 1, 2011 - 9:14 AM	Sara J Minor - Fantastic! July 2, 2011 - 1:54 AM	Stephen Tyler - Great images. Great narrative. 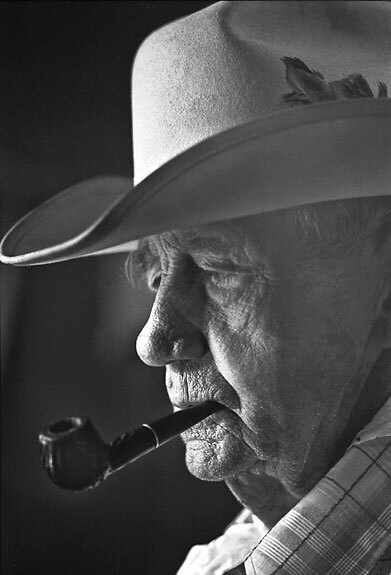 A true cowboy story for the times..
July 4, 2011 - 4:36 PM	Lorelee Nichols - Keep them coming, Al. I am one who remembers seeing him in the parades. You have a couple of exquisit portraits that I might just steal! December 10, 2012 - 7:50 PM	Steve - I have one of those sewing machine that Jess Tharp is using can anybody tell me what brand it is & about when it was made, I'm guessing 1880's. I use an Adler 205-370 so I don't need the old sewing machine & I would like to sell it. You can reach me by phone (509) 362-1035 ask for Steve. Thank you! December 10, 2012 - 8:42 PM	Steve - I also have the larger one you see in that antique saddle sewing machine post card the one that looks like it has a can on top of it p.s. that can is not part of the sewing machine.and I have a Singer 7 class model 7-11 that's the only 7 class Singer with reverse and it has been reworked to stitch from 8 stitches an inch up to a 3/4 inch stich. That old singer was put in storage pact in paraffin just before the first world war by my fathers father and sat unused for nearly 100 years it has absolutely no slack in the needle or foot bar and will sew 554 nylon thread top and bottom like it was made for it all of the sewing machines I mentioned work. I want to sell these machines they take to much room in my upholstery shop HOT ROD UPHOLSTERY in Spokane WA 509 315-1588 or 509 362-1035 ask for steve you can see my shop at hotrodupholstery2012@yahoo.com I no it sounds to good to be true for vintage sewing machine buffs but my family has been the sewing business on and off nisce 1888 O by the way I also an 1862 howe B sewing machine it works to.